Edmiston & Company reports its commission of the construction of a 57m Feadship superyacht with exterior styling by Eidsgaard Design. The keel laying has just taken place in The Netherlands. Following the launches of 78m Hampshire II and Tango and 99m Madame Gu – the largest Dutch-built yacht – this will will be the fourth new-build Feadship yacht commissioned and managed by Edmiston. 'We are delighted to be managing yet another project at Feadship and to be working with the team at Eidsgaard once again,' says Jacqueline Lyne, director of Edmiston Yacht Management. The exterior by Eidsgaard is described as 'radical' and current renderings show long, sleek windows and a forward-raking radar arch that flows over the pilothouse. Inside, she will accommodate 12 guests in an owners' stateroom and five guest cabins on main-deck with accommodation for 15 crew. The yacht is designed for world cruising, projected to achieve a range of 5,000 nautical miles and top out at a maximum speed of 16 knots. 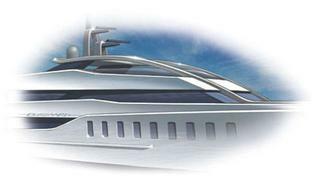 The 57m yacht is scheduled to be delivered in 2015. This follows on the heels of a 67m Eidsgaard-designed yacht that Feadship began work on in November 2012, also scheduled to deliver in 2015.